The Jean de Vienne’s Lynx helicopter, flying with HMAS Warramunga’s Seahawk helicopter was conducting routine surveillance in the international waters of the Arabian Sea as part of Combined Maritime Forces (CMF). Detecting a vessel of interest, the Jean de Vienne tracked the dhow to investigate further and determined the vessel was without nationality. 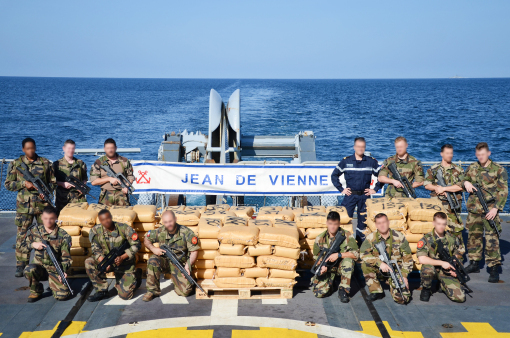 Boarding teams from Jean de Vienne then conducted a non-destructive search of the vessel, locating 4 tonnes of hashish, valued at over $130 Million USD. After a thorough search, the illegal narcotics were catalogued and transferred to Jean de Vienne for safe destruction at sea. On March 3 and 4, 2018, HMAS Warramunga conducted 2 boardings in the Arabian Sea, locating over 7 tonnes of hashish, valued at over $300 Million USD. Since December 2017, multinational assets in support of CTF150 have seized over 31 tonnes of hashish and 1.5 tonnes of heroin, valued in excess of $1.4 Billion USD. This is the ninth confiscation of drugs by CTF 150, currently under Australian leadership, with a combined Australian and Canadian staff and supported by assets from partner nations like Australia, France, New Zealand, Pakistan, the United Kingdom, and the United States.